Boy, our Street Smarts answer in the Everett Herald sure sparked a lot of debate this week. We responded to a reader question about the cost of putting a sign in a particular location. In the original article (printed two weeks ago), we were explaining why we DIDN’T put the sign in the location because, among other things, cost was an issue. When we were explaining how costs can be high, we used an outside, worst-case scenario number factoring in everything that could go wrong as support for our position to not put up the sign. We also tried to explain that putting up a sign is not as simple as pounding a couple posts into the ground. We threw out some upper end, worst-case scenario numbers…and they went viral. KIRO 97.3 radio host Dori Monson challenged us live on air to compare his cost list to ours. Here’s the interview. Here’s a write up. (Incidentally, I like this one because it shows a picture of the kind of sign and many people think we are talking about a small side-of-the-road speed limit sign.) As you heard, the end result shows Monson Construction and WSDOT were about the same. Then KOMO AM 1000’s Ken Schram gave us the Schrammie. If you don’t know, that’s an award he gives out each week for waste or a “duh” moment. What can I say? 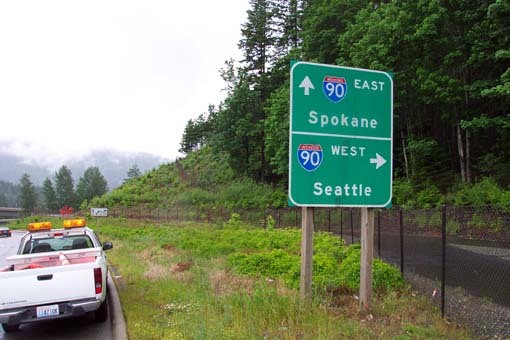 WSDOT is low-hanging fruit for the media. So here, once again, is an attempt at the breakdown of possible costs – all variable of course due to the location and size of the sign: There is coordination with utilities so you don’t cut fiber lines; there’s ordering the sign, building the sign with special bracing so it doesn’t flap in the wind, driving to and from the site, gas for all the vehicles, digging holes, placing rebar, pouring concrete, installing anchor plates, closing lanes for several hours, bringing a hoist out to place the 15-foot tall posts and setting up the 250 pound sign. It’s specially designed to “break away” so when someone hits it, drivers won’t be injured. You need special materials for that. Returning to the area a second time when the concrete has cured to finish the work. All in all, this particular kind of sign in a similar location cost $10,000. Our workers make $20/hour. When they work at night they get an additional 65 cents an hour. We work hard to keep our costs down and our transparency up. We work hard to explain the process of following laws, laws designed to keep people safe on the highways, laws designed to keep our water and air clean (AKA “environmental regulations”), laws that say signs must be large enough you can see them with old eyes driving by at 65 miles per hour and laws that say you can’t kill someone with a defective sign after you build it and walk away. It is frustrating to us when we try to be accountable to taxpayers and explain a worst case and best case scenarios, readers and media quickly jump to the worst numbers. As part of the I-405 Bellevue Braids Project crews are removing the old NE 12th Street Bridge to replace it with a new bridge. The new bridge will be longer and wider and accommodate new ramps traveling to SR 520 and I-405. from the inside of the NE 12th Street bridge. wood, rebar and concrete are all being recycled locally. Crews will use heavy equipment to crunch the old NE 12th Street Bridge down and the countdown begins. On April 1 we’ll close all lanes of I-405 through downtown Bellevue to safely remove the bridge that’s spanned I-405 since 1970. Located just south of I-405/SR 520 interchange the old NE 12th Street Bridge runs about 300 feet long and 54 feet wide and is just 14 feet above I-405. The new bridge will be 384 feet long, 96 feet wide and 16 1/2 feet above I-405. The wider bridge will have a bicycle and pedestrian lane separated from traffic. The total weight of debris being moved from the old bridge is equivalent to the weight of 2 Statue of Liberties. Nearly 8 million pounds (4000 tons) of concrete will be crunched into smaller chunks and hauled away—about the weight of 21 Boeing 747s. 450,000 pounds (225 tons) of rebar will be extracted. This is equivalent to the weight of an adult blue whale. 1.3 million pounds (675 tons) of sand will be placed on the roadway - acting as a buffer to protect the roadway from falling debris from the bridge. The final number may be the most important. No Fooling - beginning Friday, April 1 at 11pm we’ll close I-405 completely in both directions for 53 hours. You won’t be able travel I-405 through downtown Bellevue for the remainder of the weekend until Monday at 4 am, but there are detours in place. What were you doing on March 22 at around 5 p.m.? Driving home from work, getting ready to make dinner, running last minute errands, taking the kids to soccer practice? Well, if you worked for us, your night was busy dealing with the aftermath of a rockslide. Yes, we are very relieved that fence was there. 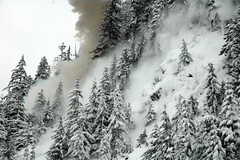 A large boulder the size of a pick-up truck pushed its way out of the hillside along I-90 over Snoqualmie Pass just west of the snowshed. 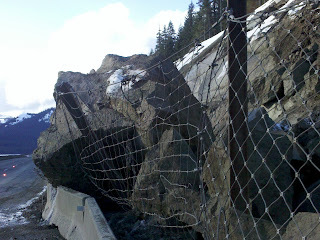 Before the boulder could make its way to the highway, a rockfall fence stopped it dead in its tracks. 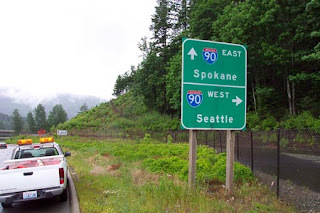 As you were driving home from work, you heard the local news mention that I-90 over Snoqualmie Pass was closed westbound from milepost 54 to milepost 70 due to a rockfall. The first thing that comes to your mind is how long is it going to be closed? Do they really need to keep it closed over night? These are all good questions that I’m sure are asked a lot whenever we close a highway. But the primary reason we close the highway, especially due to rockslides, is for your safety. Our work begins once we close the highway. Great perspective as to how large the rock is. On March 22, crews were busy late into the night making calls to our contractor, Max J. Kuney, to find out how quickly they could gather equipment to remove the 12 foot by 6 foot boulder. They called our geotechnical crews from Olympia, brought in a consulting geotech from the I-90 Hyak to Keechelus Dam Improvement Project out to the rockslide to evaluate the hillside. Crews even took photos of the rockslide so the media could show you what we were really dealing with. Once the geotech evaluated the hillside, we got the thumbs up to open one of the westbound lanes to traffic. Crews broke up the large boulder into smaller pieces to make it easier to remove from the side of the highway just before lunch on March 23. Now it’s just a matter of time and patience. Crews are working to clear the shoulder of debris and rocks while keeping other factors in mind such as traffic, daylight and weather. Before crews can hop in their cars, grab a late meal, and make it home in time to tuck their kids into bed, they must finish removing debris from the ditch and restore drainage along I-90. The U.S. Secretary of Transportation Ray LaHood recently blogged about the Department of Transportation’s partnership with AARP and their united effort to ensure that as our nation’s drivers age that they are safe, secure and prepared on our roads. A key area of this new partnership focuses their “We Need To Talk” program, which offers families helpful guidance on how to broach the sensitive subject of determining the appropriate time for an elderly family member to stop driving. The AAA Foundation for Traffic Safety is encouraged by the actions taken by USDOT and AARP and hope to see similar partnerships develop in the future. With the number of drivers 55 and older expected to increase by more than half by 2030, senior driver safety is something all road users need to be informed about. The Foundation shares in this commitment and understands what a difficult decision and subsequent conversation it can be to take away a parent or grandparent’s keys. The senior driver resources offered by AAA Foundation and AARP can help ease this process and related anxiety and resistance. The Foundation’s senior driving website provides resources such as free online quizzes, brochures, and a self screening tool that tests certain physical and mental abilities that are important for safe driving. Additionally, AAA’s senior driver website also offers valuable information including the effects of aging on drivers, tips for family members, and a list of warning signs to watch for among aging drivers. Safety is our ultimate goal, and we want to equip senior drivers and their families with as many tools and resources as possible to combat this vital transportation issue. The snow was falling heavily as I kneeled in the snow high above Snoqualmie Pass. 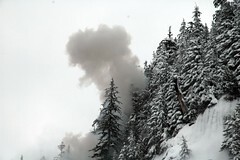 It was 11 p.m. and I was at the normal ignition site, for East Snow Shed avalanche #4. For the last six hours, our snowplow drivers had been fighting snow, struggling to keep traffic moving across the busiest mountain pass in the state. Crews were out plowing, pushing semis over Heartbreak Hill, and assisting unprepared motorists who were stuck. Snoqualmie Pass was closed and everyone was waiting for me. 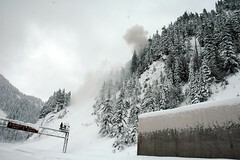 It was time to detonate the explosives that would trigger controlled avalanches. Three explosive bags were assembled and hanging on their respective lines above the starting points. All three were connected with 18-grain detonation cord. A non-electric ignition cap was taped to the trunk detonation cord and I was clear to ignite the cap with a device called a shooter. Normally, the pressure to get a good light is never an issue. You just move methodically and do it right the first time. Then, as if in slow motion, the shooter rolled off my fingers and sunk into the snow. I picked it up out of snow and started brushing the snow off of it. I couldn’t seem to get it clean. It was then that I realized just how heavily it was snowing. Each snowflake that landed on the shooter seemed to get bigger and bigger. Finally, I got it cleaned off. I then carefully assembled the shooter with its ignition cap and tried to lace the non-electric cord through the shooter. Only, I couldn’t get the cord to go through the hole in the shooter. I tried again and failed. Time seemed to slow down. I noticed my wet hands shaking; I hunkered down even more over the shooter to shelter it from the snow. My head lamp blazed brightly onto my wet hands, wet shooter and unlaced cord. Then I heard my partner’s bomb explode. Now everyone was truly waiting on me. I forced myself to breathe and move methodically. The cord easily slipped through the lacing hole and seated nicely into the firing chamber. I looked the whole system over one last time; everything looked good. I went for the light… BOOM! PHEW! I bounced up off the snow and gazed at the starting zones. I saw fractures in the upper part of the starting zones. I loosened the trams and headed for the other side of the pass for the next round of blasting at 1 a.m.
Immersed in music and late-night chatter, folks dancing at "Shelly's Leg" on Dec. 4, 1975 might not have heard screeching tires on wet pavement, or the impact of the gasoline tanker hitting a guardrail on the Alaskan Way Viaduct some 40 feet above the popular disco's doorstep. But there's no mistaking what they saw in the moments following the crash. "We were inside Shelly's dancing when I looked out a window and saw this huge ball of flames coming at us," 23-year-old Alice Drake told the Seattle Times. When the fireball arrived, the windows shattered. The music stopped. Security guards blocked the front entrance and began ushering patrons out a side door and into the rainy night. "Everybody started panicking and running," Drake said. 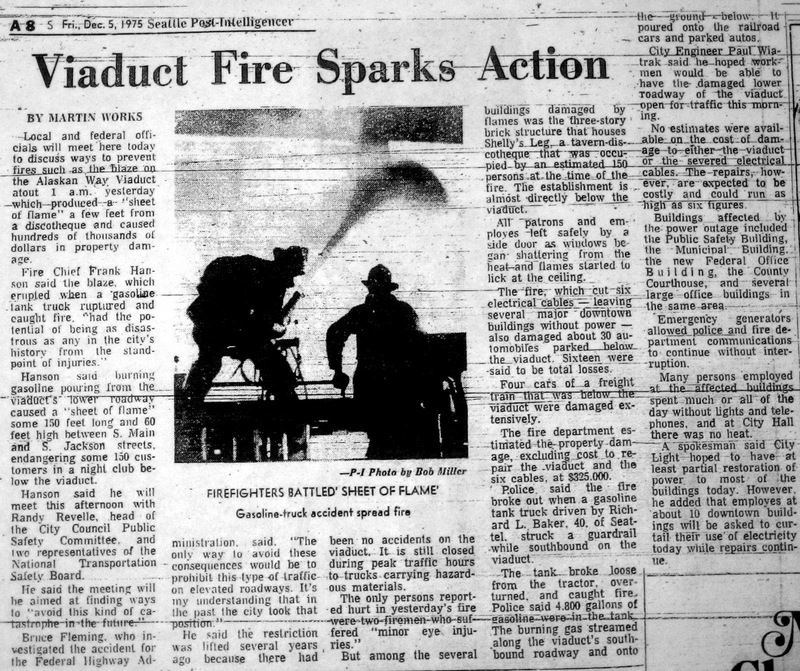 Despite the panic – and heat that was intense enough to knock out power to downtown and send chunks of the viaduct tumbling to the street below – none of the 150 people in the disco that night were hurt. Neither was the driver of the truck, 40-year-old Richard Leroy Baker. 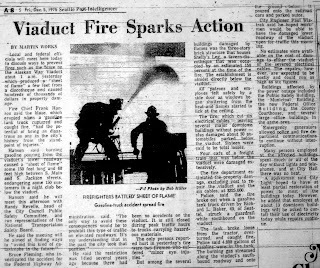 In fact no one – save for the eye irritation of two firefighters – was injured in the fire, which took 45 minutes to extinguish. Even the viaduct itself remained mostly unscathed, reopening to traffic the next morning after a brief closure that allowed crews to make minor repairs and do a safety inspection. More than 35 years later, Shelly's Leg is gone, and the viaduct's days are numbered. But they remain inextricably linked, a history forgotten to most except for longtime Seattleites and local history buffs. Which is why we're pleased to unveil a new website that celebrates the viaduct and its place in state and local history. Launched on March 2, the site lets users dig into the structure's – and Seattle's – past. Along with facts, figures and photos of the viaduct, it features a timeline of culturally and geologically significant events, information about local archaeology, details about historical buildings near the viaduct, and games and activities for kids. 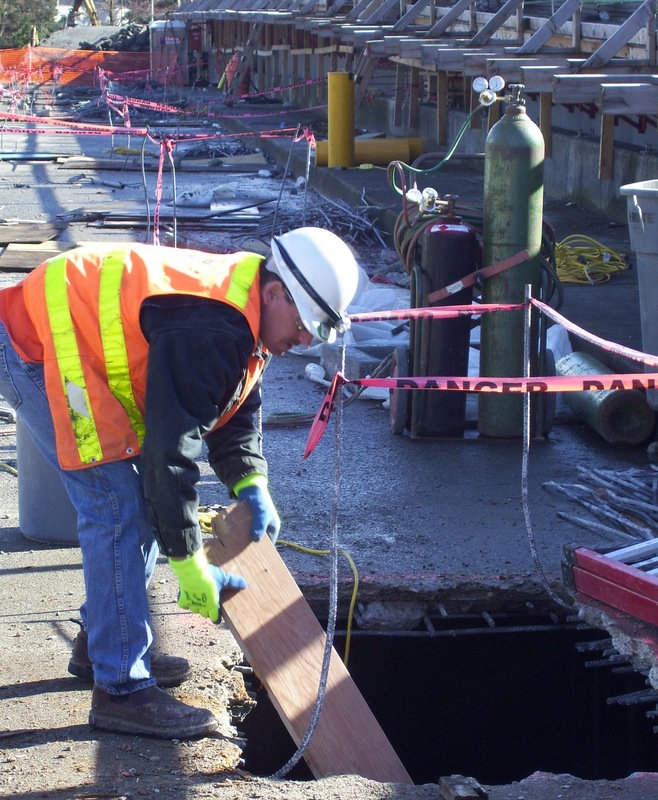 We worked with local historians, cultural resources experts and state and local agencies as we developed the site, which fulfills a commitment WSDOT made to the Department of Archaeology and Historic Preservation. We also linked to Washington state historical website historylink.org, in case visitors want to explore something they see in further detail. The site launch comes only two weeks after we demolished the first piece of the viaduct, and a little over a year before we take down the structure's southern mile. Are we excited to demolish the viaduct? You bet. It's old and seismically vulnerable. It needs to be replaced. But we also recognize its unique place in history. And so we're excited to pay tribute to the viaduct's concrete and steel, and to the people – the engineers who dreamed it, the construction workers who built it, the drivers who use it, and the folks burning down the house that night at Shelly's Leg – who gave the structure its story. 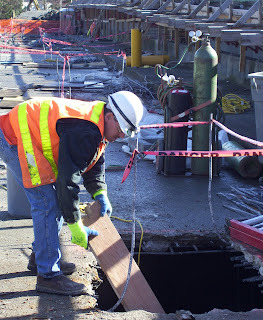 Update 3/08/11: The Alaskan Way Viaduct history website has been temporarily removed. 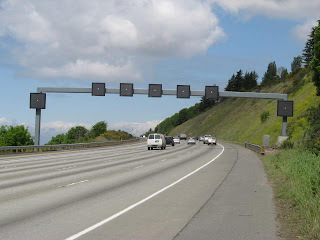 This site was developed by the Washington State Department of Transportation and the Federal Highway Administration to comply with an agreement related to the National Historic Preservation Act. A party to this agreement has requested time to provide feedback on the website. We will restore the site shortly. When a semi-truck lost its load on northbound I-5 in Federal Way on Tuesday afternoon, our construction crews were close by to help with the cleanup. The truck’s trailer overturned on the freeway right next to the area where we’re working to build two new flyover ramps between I-5 and Highway 18. WSDOT inspector Ken Stamper was first on the scene, using his truck to block off lanes. A front-end loader from Mowat Construction wasn’t far behind, ready to scoop up the huge chunks of scrap metal that were littering the entire freeway. A WSDOT street sweeper was also in the area and came to help. 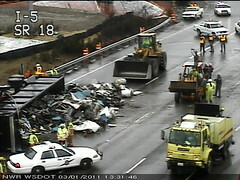 While the heavy equipment moved the metal back into the trailer bed, other construction crews grabbed brooms to sweep up the mess. Traffic was moving again within the hour. Normally, when a semi loses its load on the freeway it can block lanes for several hours. Just getting cleanup crews through the long backup usually takes awhile. But in this case, WSDOT and contractor crews instantly sprung into action when duty called right next to their work zone. Aleta Borschowa, WSDOT’s construction engineer on the project, said they plan for situations just like this. “Whenever the State Patrol asks for help, we’re more than happy to lend a hand,” she said. These workers were part of a project to build two new flyover ramps that will eliminate lane weaving at the busy I-5/SR 18/SR 161 interchange.